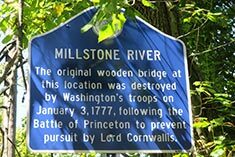 The 25-mile Millstone River Scenic Byway is situated in central New Jersey, largely in Somerset County, but also in small portions of Mercer and Middlesex counties. The historic Delaware and Raritan Canal runs through most of the Byway with Canal Road on one side and River Road on the other. It was designated a New Jersey Scenic Byway in 2001 and it became one of two New Jersey Scenic Byways that were nationally designated in 2009. The long and narrow Millstone Valley is the flood plain of the Millstone River and its many tributaries. It is a scenic area settled by Europeans in the late 1600s and early 1700s and was home to the Lenni Lenape people before settlers arrived. The river served as an early means of transportation as did Indian trails, which both paralleled and crossed the river. These trails later became the roadway system for this area, including Canal Road and River Road which comprise the core of the Byway. The land between Canal and River Roads is now part of the Delaware and Raritan Canal State Park. The Millstone Valley Scenic Byway Visitor Center is located in the Griggstown Bridgetender's House and is open weekends to the public from April to October. 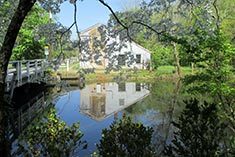 In addition, Rockingham and the Delaware and Raritan Canal are both listed as sites on the National Register of Historic Places. Travel north on Kingston-Rocky Hill Road (Route 603). Continue through the Route 518 intersection where the road becomes Canal Road. Take Canal Road north and turn left at the Amwell Road (Route 514) intersection. Turn left onto River Road (Route 533) and travel south. Make a left onto Bridgepoint Road (Route 609) and another left onto Route 206. At next intersection, make a left onto Montgomery Avenue. Continue straight at the intersection of Montgomery Avenue and Washington Street by crossing Washington Street to Reeve Street (formally Church Street). Continue a short distance and make a left onto Crescent Avenue (formally South Street) at the intersection of Crescent Avenue and Reeve Street. Go through the Crescent and Princeton Avenues intersection and bear right at the intersection of River Road and Crescent Avenue and follow River Road (Route 605) into Kingston. Turn left onto Route 27. The route ends at Kingston Lock which provides parking, a gateway and base for the southern end of the Byway.